H.E. 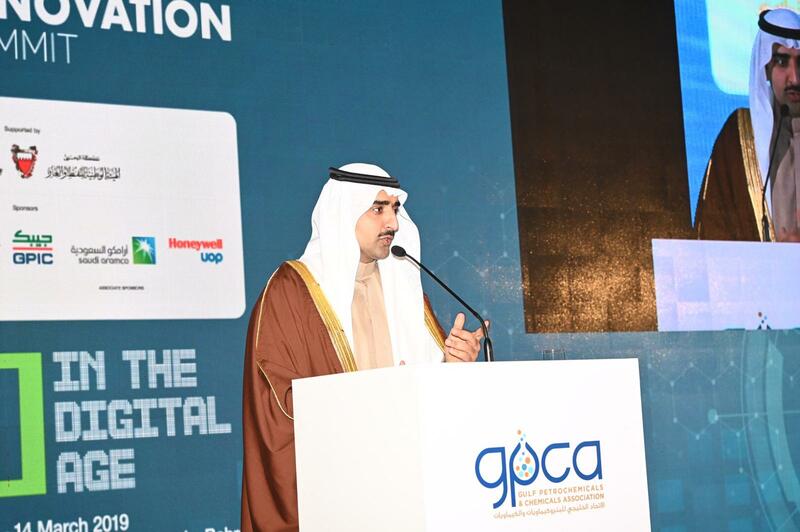 Shaikh Mohammed bin Khalifa Al Khalifa, Minister of Oil, inaugurated on Wednesday morning, March 13 2019, the activities of the Gulf Petrochemicals & Chemicals Association (GPCA) Research and Innovation (R&I) Summit, with the participation of more than 300 participants from international leaders and experts in the chemical industry and senior officials from regional government bodies and circles from 81 countries across the world. With the aim of exchanging ideas on strengthening strategic partnerships, diversification strategies and growth in the era of the fourth industrial revolution. H.E. the Minister of Oil praised the convening of this forum in the Kingdom of Bahrain, because of the Kingdom good reputation in attracting various specialized activities in the oil sector in order to see the latest technology to enhance the competitiveness in the local, regional and global markets. Noting the importance of this forum, which is a global platform that attracts executive leaders in the energy sector to discuss and exchange views and perspectives on the pressing issues affecting the growth of the sector and how to develop it in the future. H.E. the Minister of Oil stressed the importance of the GCC countries and the Middle East to invest in research and innovation and to provide the best to ensure the steady supply of high quality of the world's increasing demand for chemicals due to the population increase in the world. Adding that the world today is witnessing fierce competition among the various international companies and many challenges in the context of globalization and digitization that need to work hard overcome these difficulties and challenges by entering through the portal of innovation and research development in the chemical industries that produces new products that are identical to the modern international standards. Noting the ongoing support and backing of governments in the GCC countries to overcome the many challenges of maintaining competitiveness in this dynamic and changing market. H.E. the Minister said that Gulf Petrochemical Industries Company (GPIC) is working very hard to achieve the ambitions and high achievements through the interest in innovation and many researches and training of human cadres to develop the process of production and export of products (ammonia, urea and methanol) to the world market. Where a total of 1.13 million tons of products were exported with an increase of 1.0% higher than planned in 2018 and GPIC has achieved a lot of global achievements at various levels. In conclusion, H.E. the Minister of Oil, expressed his thanks and appreciation to Dr. Abdulwahab Al Sadoun, Secretary General of GPCA and Mr. Moayad Al-Qurtas Chairman of the Innovation and Research Committee at GIPCA and to all participants and speakers from all around the world and supporting companies and to all those who contributed to the success of this important forum, wishing everyone the best to succeed and achieve the future aspirations that serve this vital sector. Afterwards, Dr. Abdulwahab Al Sadoun, extended his thanks and appreciation to H.E. the Minister of Oil and to the Government of the Kingdom of Bahrain for the continued support of the petrochemical and chemical sector. Noted in his speech the importance of the role of innovation and creativity in the development of specialized technologies in the industries that help enable solutions of competitive value to meet customer needs, improve operations, and reduce capital expenditures. Dr. Abdulrahman Jawahery, President at GPIC, explained that the forum presented many technical papers that carry good ideas for developing specialized business in these strategic industries. Noting that the nature of the industry is largely related to many challenges that need to be constantly explored for innovative solutions to meet such challenges. Praising the efforts of the National Oil and Gas Authority (NOGA) and the significant support provided by industrial companies in Bahrain. The forum highlighted specialized topics, including the recycling of plastics to achieve economic, environmental and social benefits, the importance of investing in research and innovation to develop new degrees of implementation that improve environmental sustainability, digitization and its impact on research and innovation in the chemical industry, the technology of oil to chemicals from a research and development perspective, artificial intelligence and control of processes 2.0 and other related topics. It is worth mentioning that GPCA was established in 2006 to represent the hydrocarbon industry in the Arabian Gulf region. The union is considered to be of interest to more than 250 companies and institutions specializing in the chemical and allied industries. The petrochemical and chemical industry is the second largest industrial sector in the region, producing more than $108 billion products each year.